On 26th July 1986 a train derailed after striking a van at an open level crossing in a remote East Yorkshire village. The resulting carnage killed nine people, injured 42 and left dozens of survivors and families reeling from the shock for the rest of their lives. Now for the first time the full story of that tragedy can be told by the people who were there. The horror of the survivors, the bravery of the rescuers and the heartache for the people left behind. 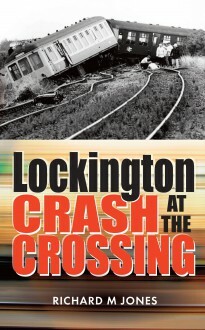 From one disaster came a campaign to have open crossings banned and to make sure a disaster like Lockington will never happen again. Richard M Jones is a researcher who has made it his life’s ambition to record forgotten disasters and events lost to history. His achievements include writing the first book about the Great Gale of 1871 and placing a memorial for the Lockington victims. A serving member of the Royal Navy, he lives in Bridlington.